Have you ever read a book which affects you so strongly, you have to tell someone? I just read I Was Anastasia by Ariel Lawhorn - or at least, read the first couple of chapters then dipped in to others - and honestly I can not rest until I've spoken about it. I have researched the family of the last Russian tsar since I was a teenager. There are many reasons why, but mainly something in the eyes of the three eldest daughters speaks to me. They seem to have a gentleness and depth of soul that calls out for friendship and recognition even so long after their deaths (one hundred years ago on July 17th). For years, I read everything I could about them. This was in the days before the internet, and even before interloans, so I took many trips to small, obscure libraries in order to find Romanov biographies and watched old film footage on microfiche in basements. I studied Russian history and literature at university. When the internet revealed hundreds of private photographs, letters, diaries, films, and information, I absorbed it all. I tell you this (and some of you may remember I've written about it before) so you understand my opinion of I Was Anastasia, is an informed one. The book is beautifully written. The structure is clever, alternating between Anastasia Romanov impersonator Anna Anderson's plotline, which moves back in time, and Anastasia's own plotline covering the imperial family's last months of life. Lawhorn has skipped many significant events, but I understand the constraints that drove her to this. She admits to taking liberties and that's fine, it's a big story. Personally I disagree with her view of Anna Anderson, but that's okay, we know a lot about the woman but not really anything certain about her interior life, considering she wove such a vast lie about herself. I really was inclined to love this book. However, so much is wrong with the characterisations that I felt compelled to respond. I could tell you how she unfairly makes Kerensky into a cruel man. How she simplifies the guards, thus eradicating some very interesting dynamics from the story. And more. 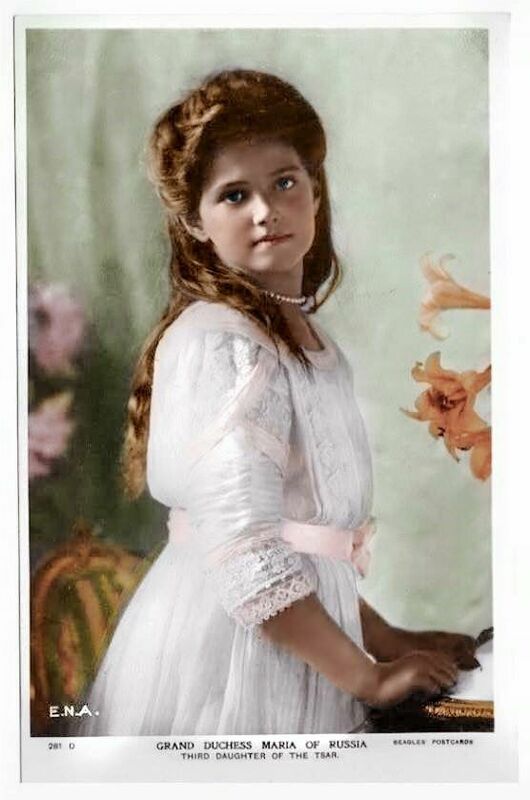 But in the interests of keeping this post relatively short, I'll focus only on Grand Duchess Maria Romanov. Maria was the family sweetheart, a girl so good her father said he was "afraid of the wings growing." She was humble, kind, gentle-natured, and rather squelched beneath the forceful character of her younger sister Anastasia. As with all her family, she was highly religious, and although she had a teenaged girl's inclination to flirt innocently, ultimately hers was an impeccable character. Even the guards imprisoning the family liked her. When she was caught in an indelicate position with one of those guards who had smuggled in a cake on her birthday, it almost certainly involved no more than secret kissing, if even that. Lawhorn however cheapens Maria's character, presenting her as vain (infact her family laughed at her for being "fat" and clumsy, so I doubt she had a lot of self-confidence, and besides, at the time of the story she was actually deathly ill with measles and pnuemonia, following which she had her hair shaved off, facts Lawhorn omitted), also that she was grumpy about having to do manual labour in the gardens when infact she loved it, that she was reluctant to accompany her parents on a dangerous journey although nothing could be further from the truth, and finally Lawhorn makes her far more libidinous than she ever would have been - or could have been, considering she was living in a small house jam-packed with people, including armed guards. As one of the villains says to Maria, "Your honour is tarnished. You will forever be known as the Romanov who spread her legs for a common soldier." This is absolutely awful because hundreds of people will read this and, trusting the author's research, believe it. Lawhorn herself has tarnished Maria's honour. Why is this important? It's only a novel, after all. And again I reiterate, Lawhorn has written it beautifully. I wish so much I could give her only praise. But to me the mischaracterisation is important because Maria does not deserve to be maligned. Infact, a miracle of healing has been ascribed to her - a fact I mention not due to any religiosity on my part, but only because such a miracle would be characteristic of her. It makes me deeply sad to think anyone will read Lawhorn's book and think she was less than she really was, especially after all she went through in her life and how she maintained her generosity and goodness to the very end, even in the face of hardship, terror, and cruelty. But there's a deeper question here that I'm struggling with. Historic fiction must be hard to write. Weaving the truth in with narrative strength and clarity ... deciding what is most important ... making the characters speak effectively on the page ... forming educated guesses when there are gaps. I doubt I could do it well. But where should we draw the line between literary licence and slander? So many of the changes to Maria's character seemed purposeless other than to make her a foil for Anastasia. Lawhorn even changes how Maria died - giving her an instant death, when infact Maria suffered horribly, finally perishing long after the rest of her family. Why take even that from her? I know I sound like a Romanov fangirl (a nicer word is scholar), but really, beyond my concern for Maria's reputation, I wonder as a writer and a reader where we draw the line. Is it fair to change the essential character of historic figures in order to serve an author's personal ideas about storytelling? What do you think? If you've made it to the end of this epic post, I'd love to hear your opinions on this question. the colourisation in the second picture was done by klimbim. people almost always get her hair colour wrong; in real life it was honey brown. and yes this shows I know too much on the subject! I don't know as much as some people. I prefer historic fiction (which I've always been fond of) to be as true to fact as we know. I get artistic license in perhaps merging some minor characters or inventing others to clarify or speed things up, make it a bit more dramatic - but I like to know that I can TRUST in "who did what" to be as accurate as possible or at least to acknowledge "we don't know so I've chosen this version as the most likely". Making a princess look like a little tart belongs in fiction, which can be fixed quite easily by changing names and places and not pretending to ride on actual events. If she writes well as you say, she could have made a fine novel inspired by these events, but then embellished as she liked. When you write about historical actual people, I expect you to do your research and write a believable story, not a telenovela! I agree with you. Actually, the story of the Romanov's last days is fascinating, complex, and tragic, and could be told according to the facts and be even more exciting than any fiction. I've read novels of medieval woman whose characters and lives we know very little about and I never mind that the author offers up a version - although too often it's a version based on modern sensibilities about what womanhood should be, rather than what was actually likely in the medieval era. Lovely colourisations btw. whatever the hair colour. Imagine all that would have been different if they had lived. I don't know that much would have been different, to be honest. They would have gone into exile and lived quietly, raised families, etc. They were on the verge of this but the British King George (Tsar Nicholas' cousin and lookalike) changed his mind about offering sanctuary, and so they ended up dead. I would recommend non-fiction books about them, which is where you will find the true story in all its fascinating depth. Robert Massie's "Nicholas and Alexandra" is good for life before the Revolution. "The Last Days of the Romanovs" by Helen Rappaport and "The Fate of the Romanovs: by Greg King and Penny Wilson are quite good. There's also a website "The Alexander Palace Time Machine" which is an amazing resource, containing diaries, biographies written by friends and court members, letters, interviews, etc. In addition, you can also buy the diairies of the Grand Duchesses. There is a book, "The Four Sisters" which has some good information about the two elder sisters but I don't recommend it highly as it focusses to an odd degree on the parents, and also has little to say about the younger daughters. 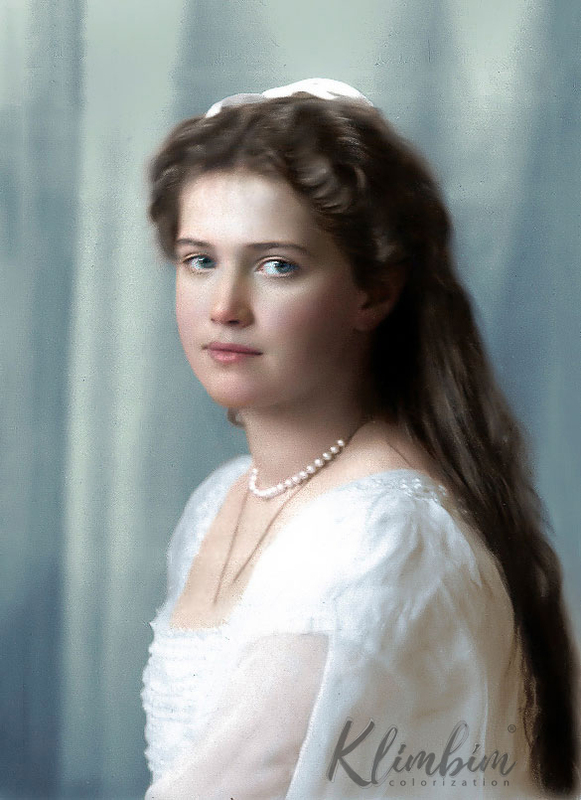 Also, I have thought over the years about whether I wanted to write a book on the Romanov sisters, maybe one day. I'd like to read it from Maria's perspective, as told by her. You seem to understand her... it would be a good book, I think. i always feel rather queasy when a writer significantly departs from the known facts about a person's character and behaviour in historical fiction (or biography!)... whether to whitewash the negatives, or to move a plot along by cheapening/changing a person, it seems a rather nasty thing to do. it just feels unfair and creepy and even a bit unethical, especially when the person in question was a murdered girl. Yes, it did feel nasty - I kept wondering what the author had against Maria. I appreciated that her heroine was Anastasia, but there was no need to degrade another's character because of that. I feel bad saying unkind things though, because writing a book is hard, and negative reviews can be hurtful. I think an author has a responsibility to present historical characters as true to life as possible. I'm okay with some licence being taken with events, but not at all okay with alterations of character. Often, authors add a note at the end or beginning of a novel to specify the liberties taken. I like that, for I think it makes me trust the author. I've always been fascinated by the Romanov story, as well. The fact the author did put a note at the end explaining her research and the licences she took, but ommitting how she ignored so many facts and changed characters, seemed worse to me because people will trust that she's accurately reflecting her research and so believe her mischaracterisations. Her acknowledgement of some liberties makes the erroneous characterization of Maria even more despicable. Perhaps the author has a heart that cannot believe in goodness. Thank you so much for writing this post, Sarah! A love for the last Russian Tsar and his family is something you and I have always shared. Like you, I studied Russian history at university, although I daresay you know far more about the Romanov's than I do. I read quite a lot of historical fiction, and I think it is absolutely unethical for an author to misrepresent persons or events for which there is a reliable historical record. It is very sad that Ms. Lawhorn chose to portray dear, good, sweet Maria inaccurately. I am deeply grateful to you for sharing the story about the miraculous healing attributed to Maria. Nina Kartasheva's account resonated with me personally. I love these kinds of stories, but then my spirituality is one of profound mystery and hope, one in which girls levitate in the trees and child martyrs answer the prayers of babushkas. Susanest, you are so beloved and such a kindred spirit to me. I loved the account of Maria's healing appearance, I believe in miracles and in the friendship of souls in all realms; I believe in Love. By the way I just have to say gosh you write even blog comments so very beautifully.